Every boat should have a properly stocked First Aid Kit that is appropriate for the boating activities that you do. Factors include; the area you are boating in (how far or how long will it take medical help to arrive), how many crew on board, the first aid skills of you and your crew and the type of activities you do. I think every boater that is close to help should have at least 30 minutes of First Aid Skills. Boaters that are in more remote areas should have higher skills and a more complete First Aid Kit. What do I mean by 30 minutes of skill? The ability to treat and stabilize a person for at least 30 minutes that has been injured NOT a First Aid Class that only lasts 30 minutes. Remember if you are home and medical help is needed a call to 911 will probably have and EMT at your door in 5 to 10 minutes. On the water you are a lot farther from help. The Coast Guard, Harbor Patrol, Sheriffs Department and other on the water marine patrols are spread a lot thinner than your local fire departments and thus have farther to travel. The contents of a Small Boat First Aid Kit and a Personal Marine Duffel First Aid Kit that I have put together are listed below. Conditions on a boat are rough with high humidity and wet interiors in many areas. Any First Aid Kit should protect the supplies from water and moisture. CAUTION: Many “marine” First Aid Kits are not sealed well but some manufactures are now putting supplies in plastic bags. A First Aid Kit can also but put in a Pelican Box or other water proof boxes. The first kit I put on a boat was “marine” but all the supplies became waterlogged from sitting in the high humidity of a boat moored in the water, so you are now forewarned. My favorite are boxes by Get Storganized in Seattle that can be purchased directly from them or from Fisheries Supply also in Seattle. Both of these kits fit in the R-4 Box which has a volume of 37 fl. oz. with an overall size of 8.5 w x 6 l x 2 1/4 d.
There are many fine First Aid Kits sold for marine use. I have a medium sized pre-packaged First Aid Kit that I have on my boat in addition to the Small Boat First Aid Kit. Below are the contents of the two small sized kits that I have put together. The first one is for small injuries on my boat when day sailing. The second kit is one that I carry in my duffel when day sailing on other boats. The contents are grouped together by type (except for the Small ouch Band-Aid Pack) in small Zip-Lock type bags, this makes finding things easier and a person only needs to open a bag with the contents that are required. 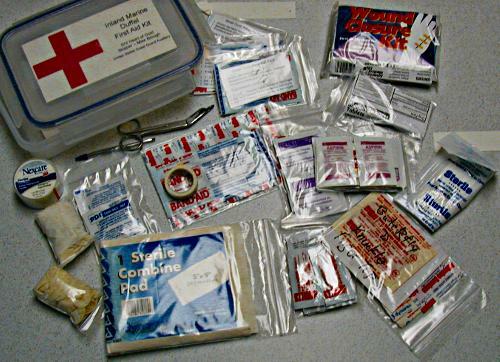 Some Kits group items together by type of injury but for a small First Aid Kit I chose to group by types of supplies. A printed list of supplies is also in each kit to let a user know what is available without emptying the whole kit or looking for something that is not present. Restocking a First Aid Kit can be a problem as most Drug Stores do not carry small cleaner, antibiotic or medication packets. I did find a few online stores but my local REI store in Seattle had a very nice stock as did Lafferty’s Pharmacy in Ballard (part of Seattle). Lafferty’s specializes in Industrial First Aid Kits for Commercial Fishing Vessels but will sell to anyone that walks in the door. Remember to check the First Aid Kit once a year for expired items. Medications and Antiseptic items have expiration dates. You should also have a small flashlight either in the kit or close by. There are some small LED lights that are as small as a quarter in diameter. One caution, I am not a medical professional, EMT or other first responder and your requirements may be very different than mine, so please evaluate your own needs very carefully and customize any First Aid Kit to your own needs, special medical requirements, and areas of your activities. Thanks and stay safe on the water. I have several of the “Small Ouch Band-Aid Packs” in every First Aid Kit. The Small Ouch Pack allows for the treatment of a small injury without needing to dig very far into a First Aid Kit. A Small Ouch Pack can easily be taken out and used to treat a small injury. I have some friends that have put a couple of the Small Ouch Packs in a plastic baggy that is then carried in a pocket of their foul weather gear or life-jacket. The Small Ouch Pack fits in a 3 x 4 inch zip-lock bag. This entry was posted in Safety Thoughts and tagged boat equipment, boating, boating safety, first aid, first aid kit. Bookmark the permalink. A small clear plastic squirter bottle of heat sterilised water is also in my first aid kit. Used in the main for flushing dirt from an eye. Can also be used for washing dirt from a wound. I sterilise by boiling the water so that no chemicals are in the fluid. The eye is a very sensitive area. I change the sterilised water every few months or after the bottle has been opened for use. Good point – I have also seen some prepackaged eye wash solutions that would store longer than your method but be more expensive. Either way a good addition. Strange as it sounds, I make sure to have a pair of needle nose pliers that can cut metal. I have removed fishing hooks, twice, and after pushing the barbed hook through, needed something to sever the metal shank portion of the hook. Once the shank is cut,it may be removed with relative safety. Then just need to treat the puncture until professional medical attention and a tetanus shot is administered. We occasionally hear stories like this from our SkiSafe clients. Good point on the needle nose pliers. I have needle nose pliers and side cutters on the boat which is probably part of the reason I left them off the First Aid Kit list. I also have a Leatherman Tool that I carry in my pocket at all time. I also don’t fish.